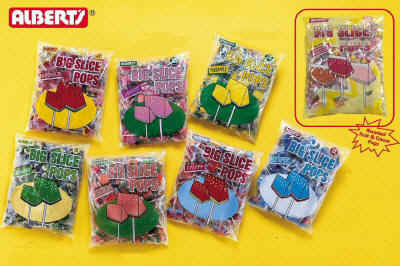 Big Slice Blue Raspberry Pops 48ct - $6.50 - Other Albert's Big Slice Pop flavors include Watermelon, Blue Raspberry, Cherry, Strawberry, Peach, Pineapple, Green Apple in 48 pop bags. 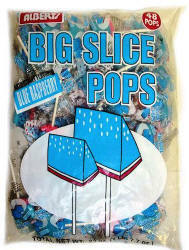 Big Slice Blue Raspberry lollipops make this impossible treat a reality. These wedge-shaped suckers defy nature to offer you a lip-smacking slice of sweet and tart blue raspberry flavor. You may not believe it, but you’ll definitely eat it! Sugar, Corn Syrup, Citric Acid, Artificial Flavor, Artificial Colors including Blue 1, Red 3 and Titanium Dioxide; and Soy Lecithin.